Roger Federer said he had to use his "whole repertoire" to get the better of Bernard Tomic at the Australian Open. The 17-time Grand Slam champion beat the 20-year-old Australian 6-4 7-6 (7-5) 6 1 to reach the fourth round. It was a match that had been highly anticipated ever since the draw was made, with Tomic coming into the tournament unbeaten in 2013 and having just won his first title in Sydney. Tomic has been a controversial figure in his short career and was dropped from the Australian Davis Cup squad last year for his attitude both on and off the court. 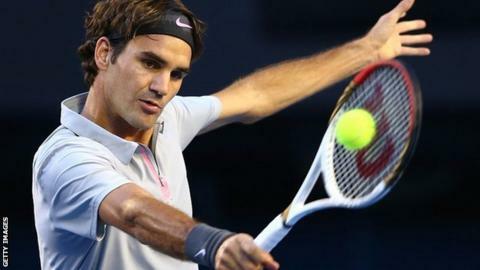 But the 6ft 5in world number 43 has shown a greater sense of discipline and focus in the early weeks of this year and his form suggested he could trouble Federer. The Swiss beat Tomic for the loss of just eight games in Melbourne 12 months ago and won both their other meetings, but the youngster put up much sterner resistance this time in a high-quality encounter. "I've seen and felt myself playing before so many times that I feel I didn't come up with a shot that I never hit before in my life," said the Swiss. "But we had some great ones and I had to be able to bring the whole repertoire to the court today, defence and offence, which I enjoy." The 31-year-old added: "The crowds were great, so I really enjoyed myself out there. Obviously, the result is something I was hoping for, but not sure going into it. "So I'm just really pleased that the outcome is what I was hoping for. I'm happy also with my playing. I thought I played really good today." Tomic said last year that he could see himself becoming "the best-ever player to play this game" and Federer warned against straying from the "pretty humble" behaviour of most tennis players. "I think it's important to be confident, but obviously you respect the game and you respect the other players," said the four-time Australian Open champion. "I think he has a lot of respect for me. But I'm only one guy out of hundreds out there, so it's important to respect all of us because we make each other better players, all of us. So we should be thankful to that." Tomic admitted "he got me, played better", but said it had been a far better experience than last year. "A lot of players, especially in the locker room, they idolise Roger," said Tomic. "You want to pick up anything you can from this sort of a player. He is the greatest our sport's ever had. You learn something every time you watch him. I learned something tonight as well. "You use this and you use it in a good way. It's going to make me a better player." And the Australian maintained he has what it takes to challenge the top players in the world. "It's just a matter of time when I get up to the big group of boys in the top 10," he added. "I've got to believe and do the things that I was doing the last few weeks. I know I'm going to be in there with this attitude."